We saw it too last week, and I must say we did enjoy it! I’m not a Star Trek fan like the Man here is, but I’ve watched enough to understand the universe – even if, like Tony, he caught a few jokes that I didn’t. It was surprising to me, as I usually am not a fan of Star Trek. I thought it was more “current” than most Star Trek movies. And funny, I too can only make the “V” with my left hand! Well, I can roughly do it with my right, but it’s difficult, while the left hand is a natural at it! Weird indeed. I thought the movie was good until the very end when it just…ended. Lots of building up for nothing. And I can only create the ‘V’ with my left hand too. My right hand’s attempts are pretty much laughable. I saw Star Trek the first day it came out and I thought it was great! So much so that I saw it two days later. 🙂 I’m not really a Trekkie, but I’ve seen the older movies so I was familiar with the characters. I didn’t get all of the “in” jokes, but it was funny (and fun) nonetheless. I wish I could have gone to see it in a drive-in theater! There aren’t any in D.C. (of course), but we had a couple near my home in St. Louis. They were so fun! I’m glad you and Tony had a good time. @ Kay: I agree that this movie feels more “current” somehow – I think that it could have been successful in its own right, even without having Star Trek to anchor it. As I said, it’s the only Star Trek movie I’ve ever seen, and so I am about the furthest thing from a Trekkie, but I liked it a lot. @ Christina: I’m glad that I’m not alone in being pretty onehanded in my “V”! I wonder if there’s some kind of inverse correlation with whatever your dominant hand is? Also, I suppose the movie does just kind of end… Ah well, I suppose one doesn’t really go to these kinds of films for groundbreaking storytelling and cinema. @ J.S. : Yup, the movie is still fun for those who are less familiar with the series, which I think is its greatest asset in the end. The Star Trek fanbase is huge, I’m sure, but I bet the studio was happy they were getting a lot of new people into the seats as well. It was definitely a good movie to see at the drive-in! 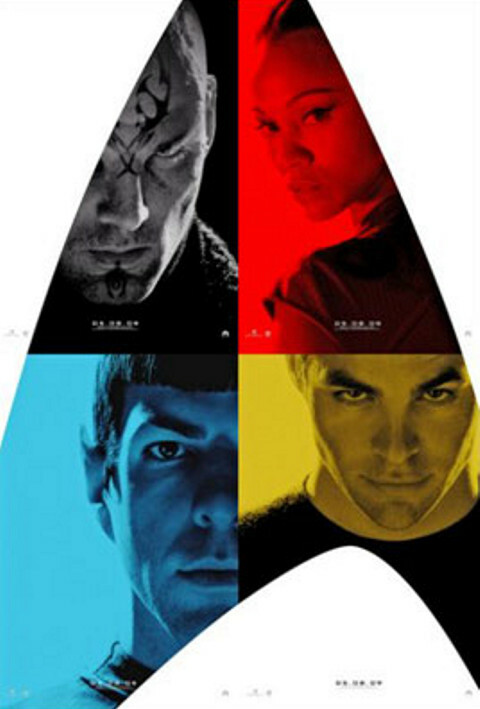 I’ve never been a Trekie, but I did like this movie. I agree the ending was a little abrupt, but I think maybe it lends itself to a sequel. @ Kim: Drive-ins are the best! I had never been to one prior to moving to Nashville, but now I am always eagerly checking to see what’s playing. And you’re right, given the price, you can afford to skip out (or sleep out!) on the second film if it’s not your thing! And yes, I am confident they’ll be doing a sequel to this film given the great response it’s gotten.